Lord, we bring to you our concerns about Bangladesh’s political and human rights climate. With Sheikh Hasina winning a third consecutive term as prime minister Monday, we are thankful the election is over, but we do ask for truth to come out about whether the election was fair and unrigged. Particularly with the delay of visas for election observer groups despite the government’s promises of openness, as well as Human Rights Watch’s statement that a "repressive political environment in Bangladesh is undermining the credibility of the process," we are concerned that something may be hidden. 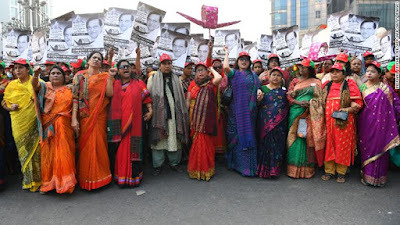 The majority of election-related deaths being on the side of the opposition and the sharp increase in unexplained arrests also do not bode well for Bangladesh. So, Lord, we commit the situation to you. We look to Hebrews 4:13: “Nothing in all creation is hidden from God's sight. Everything is uncovered and laid bare before the eyes of him to whom we must give account.” May the truth be uncovered in Bangladesh whether it is for or against the current government, and may Bangladesh’s leaders guide the nation in a healthy, God-honoring direction. In Jesus’ name we pray, amen.